The Corkscrew sub-division is 21st Century living on French Creek – a gulch that was animated by mining in the previous two centuries. The homes are high-end, but moderate in scale. Lots for sale in the neighborhood are generally one-third acre which makes the homesites more clustered, but the reservation of several parcels of open space make the area surrounding Corkscrew homes for sale feel forested, and set it apart from their neighbors. An advantage to the Corkscrew Flats community is that the lots are sunny, relatively level and very close to town, but not inside the historic district. The walk to town is easy, just slightly downhill, and a free town shuttle stops at the entrance to the neighborhood. Discover homes for sale in the neighborhood by browsing the available Corkscrew Flats real estate listings below, or, get more community information now. Corkscrew Flats homes started to be built at the inception of the subdivision that was developed late, in 2005. Today nearly 70 percent of the lots already have homes built upon them. 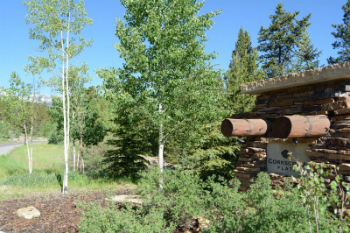 Around it is a cushion of open lots, several of which are part of the town of Breckenridge open-space portfolio. The land was developed by the Rounds family – founders of the ski company – who had purchased it from B&B Mining. From Corkscrew Flats trailheads up both sides of French Gulch are a short walk away. Many of these trails offer good terrain for Nordic skiing in the winter. 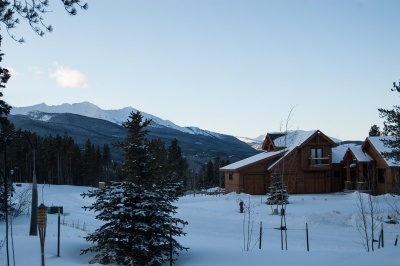 All the amenities of the resort town of Breckenridge are a short drive, bus trip, or bike ride away. Also, a paved sidewalk along Wellington Road extends from town to the Corkscrew Flats neighborhood. Size: 2548 sq. ft to 4024 sq. ft. Amenities: close to town, on the bus route, easy access to trails and great views of Peak 1 through 6. Coming into Breckenridge from the north, turn on French Gulch Road, at the 7-11, continue on the right fork through French Creek and again take the right fork onto Wellington Road. About ¼ mile from that junctions, Corkscrew will be a road on the right. Are you ready to start your home search in Corkscrew Flats, or any other Breckenridge neighborhood? Get in touch today.